In the mood to help seven females condemned to Hell find the right path to redemption? No? Then skip over to the next story. Criminal Girls: Invite only is an update to the previously released only in Japan PSP title, with added content to boot! Available both Digitally and in stores for $39.99 or $51.99 for the LE that includes an artbook, soundtrack and key chain. Santa Ana, Calif. (February 3, 2015)– NIS America is happy to announce that Criminal Girls: Invite Only will be available physically and digitally today in North America. It will be having a limited release on February 6 in the PAL regions and will not be available as a digital download in Australia or Ireland. This game will be compatible with Playstation®TV. 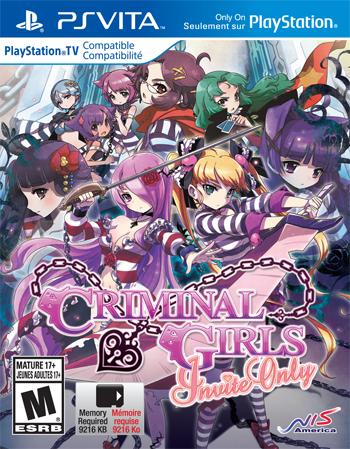 From the much adored 2010 Playstation®Portable title Criminal Girls, which was only released in Japan, developers have re-mastered the title with a host of brand new content exclusively for the Playstation®Vita. Explore the depths of Hell as you lead a female gang of delinquents on their quest to absolve themselves of their sins and be reborn on Earth. Seven delinquents, seven sins, and only one way out. Just hired for a new, mysterious job, you soon discover that this isn’t your normal prison gig. You’ve been entrusted with the care of a crew of girls whose sins have damned their souls to Hell and an eternity of punishment... Their only hope of salvation is for you to recognize their unique histories, and to guide them along the path to redemption. Navigate through the four trials of the Redemption Program, and motivate your crew of delinquents to learn the skills to redeem themselves. Touching Gameplay: Connect with the girls. Uncover each of their unique personalities through one-on-one motivational sessions with a unique use of the front touchscreen and rear touchpad. Fulfill the girls’ special requests to discover more about their interesting and often dark pasts. Criminal Girls,Reborn: This Playstation®Vita update will mark the first time a Criminal Girls game makes its way to the US, and with English text! The update also brings previously unplayable characters into the fray —Miu and Himekami— and includes brand new scenarios and levels to challenge your prison smarts. It also revamps the much lauded motivational gameplay with updated artwork, and brand new Live 2D graphics and effects.